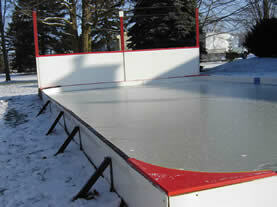 4 @ Rink Stake 5 in 1 in solid powder coated steel. This is a Presto Install accessory! What is a Presto Install? 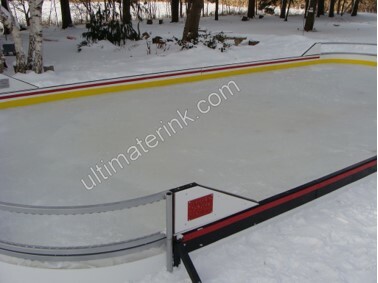 An accessory that takes little time and effort when assembling your Ultimate Rink. Rink Stake 5 in 1 Combo Pack includes Support 45’s and Spikes. 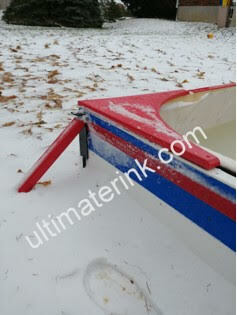 These are the perfect sized, rink frame wall support for sloped sites. 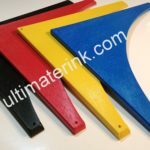 The 2″ x 2″ Support 45 pieces are available in plain wood or non-fade, solid, strong, recycled plastic timbers in your choice of matching colours (black, blue, red and yellow). These Supports are the perfect match for Corner Seats; coordinate with your son or daughter’s team or even you favourite pro team! 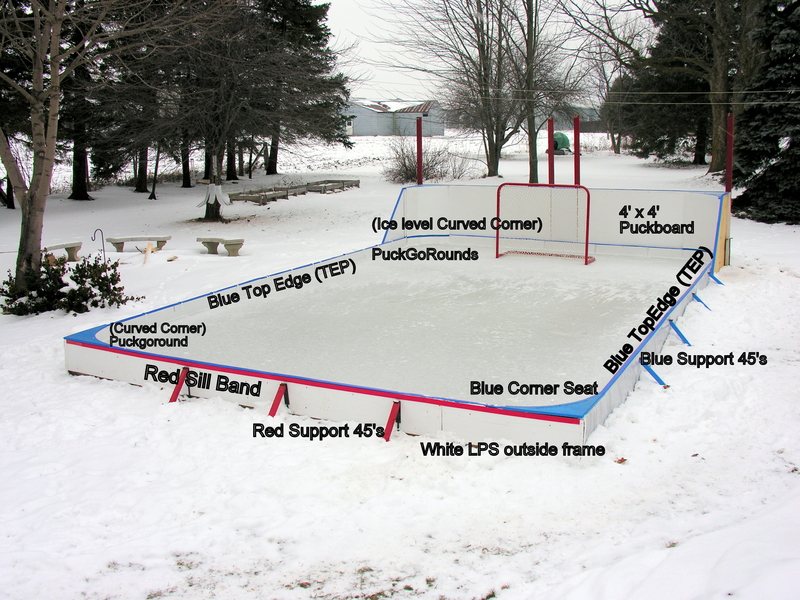 Attention Rink Builders: You Will Find This of Interest! 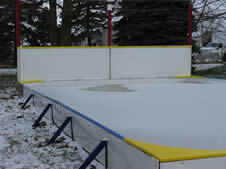 Almost all rink sites have a section or an area where one end or one side is lower than another. It is thought that 95% of backyards have a slope of more than 1%. This mere 1% of a grade results in a drop of 6″ over 50′. 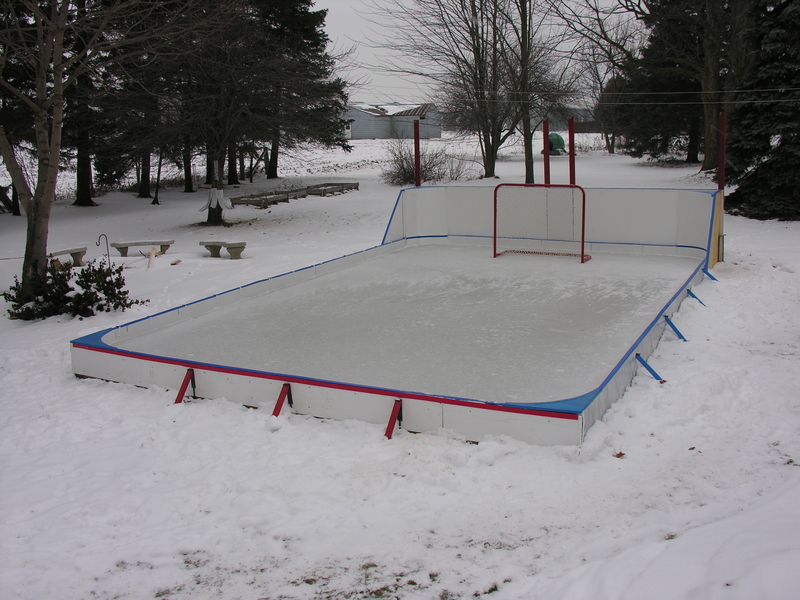 Using a wood frame in this scenario is your best way to a successful rink. You may even find opposite corners that are different. 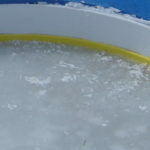 You, the builder, need to determine where your extra Rink Stake 5 in 1 placement will be for best deep water support. 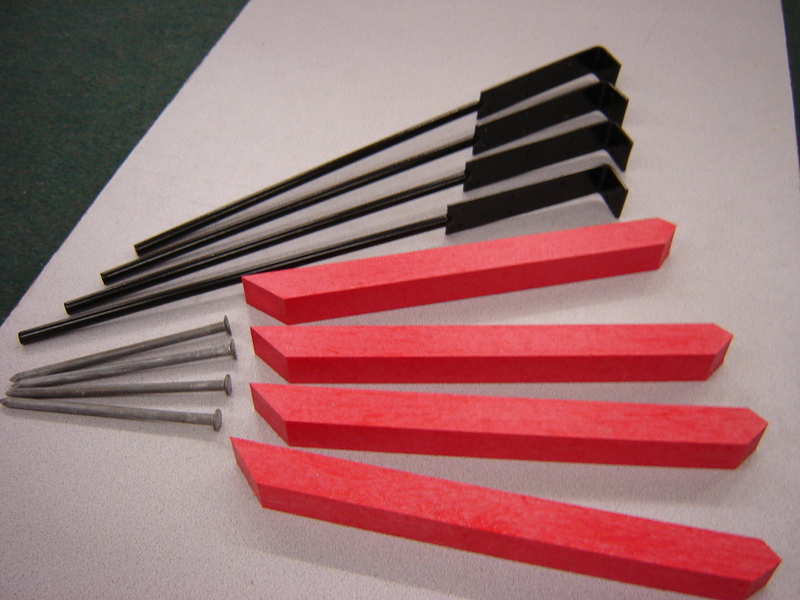 You won’t need to place your rink stakes every 2 feet. Placement is determined by water depth. Find your slope and your water depth by using a Transit, a laser line level, or a string line level. Here is the easy calculation once you have determined your slope. *If in doubt, always order a few extras. 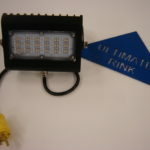 This will secure your rink system and lead to your ultimate rink success. 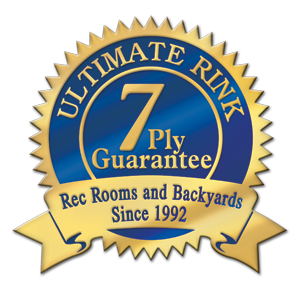 Personalize your rink so it only comes one way … The way you want it! 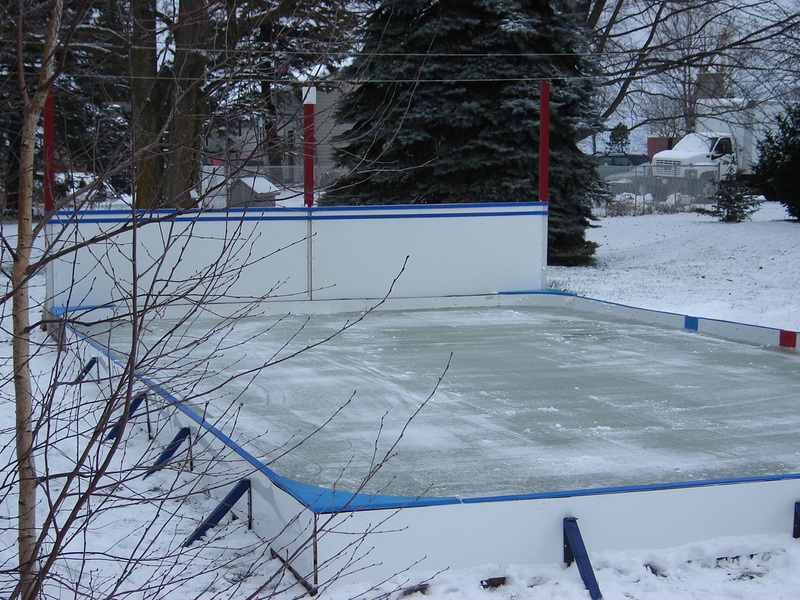 After 27 years of building rinks in every setting, on every surface, in every weather condition and handling a myriad of sloped situations we understand what it takes in your backyard. There is not a perfect yard anywhere unless you have spent time on it. Shims, lifts and fills are a normal phenomena. Dips and hollows and slopes are a regular occurrence. INVEST TIME ON THIS ONCE TO SAVE YOU SOME GRIEF PREVIOUS TO YOUR ASSEMBLY PROCESS. If you don’t have time or it is not possible in your yard to address your slope then the 5 in 1 and support 45 will come to your rescue for water depths of up to 18″. Deeper water depths can also be accommodated but will require a more heavy duty combination of the 5 in 1 in it’s sleek steel profile and Support 45 combo. 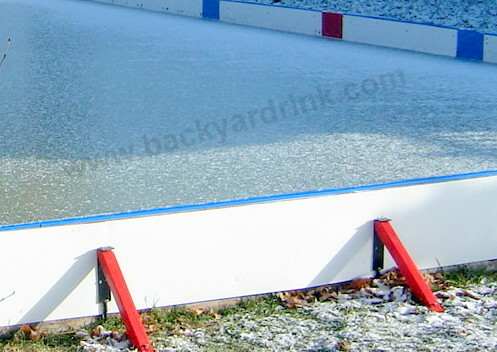 We have been advancing the art of backyard rink making for 26 years. We know!! We can answer any question you may have and direct you with professional advice and not only to make the sale! We wish to be a part of your success! See our new fully assembled Pro Panels. 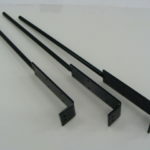 Just use your 5 in 1 Sleek rink stakes made of iron and attach them to your ready assembled Pro Panels. Professional look and coordinating colors for almost any team and all this features Presto Install and Presto Removal in the spring. Rockin the rink world since 1992!